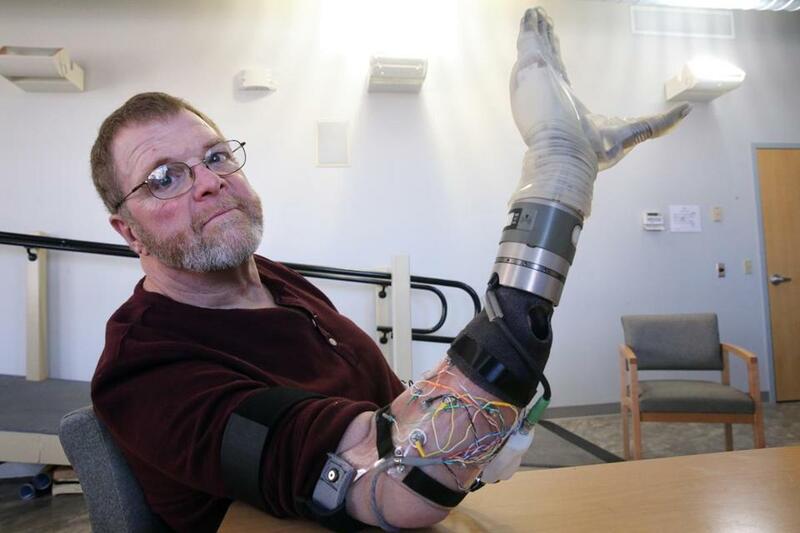 Air Force veteran Ron Currier, 63, poses for a portrait with a LUKE Arm at Next Step Bionics and Prosthetics, Inc. in Manchester, N.H.
MANCHESTER, N.H. — Ron Currier locks his eyes on an amalgamation of plastic, carbon fiber, and electrodes that substitutes for his right hand, which he lost 42 years ago after gripping a power line that sent 12,000 volts blasting through his body. Currier is told to open his prosthetic fingers, which are curled in a fist. There are no cables attached to the hand, nothing to pull or tug them open. Slowly, the fingers unfold, and a small smile creases Currier’s face. His hand has moved because he thought about moving it: The same brain signals that controlled his hand until the life-changing accident are now guiding its cutting-edge replacement. “The fact that I can sit here and actually make my hand work is absolutely amazing,” said Currier, who lost both hands while serving in the Air Force. If all goes as planned, Currier will soon have two prosthetic hands controlled solely by muscle signals transmitted from his brain, according to Matt Albuquerque, founder of a Manchester bionics company. Other amputees have been fitted with brain-controlled hands, but Currier is the first to connect these signals with the LUKE Arm, a new prosthesis developed through a public-private partnership involving Albuquerque; Dean Kamen, the New Hampshire engineer who invented the Segway scooter; and the US departments of Defense and Veterans Affairs. In Currier’s case, brain signals are read by electrodes that connect with the remnants of his forearm — the “residual limb,” as Albuquerque calls it — and trigger ordinary motions such as opening, closing, and rotating the hand, or flexing and extending the wrist. “We’re just at the tip of the iceberg of what we’ll be able to do,” said Albuquerque, president of Next Step Bionics and Prosthetics, which is housed in a 19th-century mill building near the Merrimack River. For Currier, an already vibrant life suddenly contains more possibilities. After just a few months with the new prosthetic, the 63-year-old from Strafford can now hold a grape and pull a credit card out of his wallet. And he can blow his nose, as he demonstrated one recent afternoon after walking across the room to a tissue box. “What are you doing, big guy?” Albuquerque asked. “I want to blow my nose,” Currier answered with a grin and a shrug. This summer, he wants to sky-dive. Next winter, ice climbing. He wants to make every moment count. “When I was 20 years old, I was taught a harsh lesson that the life you know can be gone in an instant,” Currier said. Another lesson is that thinking big can pay off. The project that brought Currier to this point is more than a decade in the making, has received about $36 million from a research arm of the Department of Defense, and has cleared hurdle after hurdle to develop and refine its technology. Prosthetic arms and hands for veterans had changed only incrementally since the Civil War, many consisting of an unwieldy hook connected to a shoulder harness that can cause injuries over time. Currier wore a version of that prosthesis through two rounds of debilitating shoulder reconstruction until Kamen’s engineers developed the LUKE Arm, named for a prosthesis used by Luke Skywalker in the “Star Wars” movies. Kamen said the idea of creating a new-age replacement was broached by Department of Defense officials, who asked if his Manchester-based company, DEKA Research and Development Corp., would take on a challenge that no other business seemed able or willing to. After DEKA built the arm, Next Step created a custom connection of electronics and software to send signals to Currier’s right hand. The veteran’s left side already had been fitted with a LUKE Arm, which Albuquerque said costs about $150,000. But that earlier prosthesis, which Currier owns and takes home, requires sensors on both feet to move only one hand. That means that a person who has lost both hands must initially choose one or the other for a replacement. The latest version — the one being tested on Currier’s right side — does not depend on foot sensors because it reads Currier’s muscle signals instead. For Currier and others like him, the potential is enormous. Adjusting to the prostheses is hard work. Currier has been practicing foot movements since receiving the left hand in October. Raising and lowering his feet opens and closes his fist, for example. In late January, Currier was fitted with the latest prosthesis, which is detachable. What followed has been another round of arduous, repetitive work that takes him to Next Step a few times each week to practice and fine-tune the software. In one session, Currier rested his right forearm, palm up, on a foam rubber block while Albuquerque monitored a computer screen for a real-time readout of muscle signals. Currier breathed deeply as he re-created in his mind how, more than 40 years ago, he told his hand to move. The goal is to translate muscle signals that turn thought into action. The calibration takes time, and not all attempts succeed. On this day, Currier has been working for five hours. Veterans Affairs officials in Manchester praised the public-private collaboration that led to the LUKE Arm. “What this allows us to do is have access to this type of technology right here in Manchester,” said Alfred Montoya Jr., acting director of the Manchester Veterans Affairs Medical Center. Albuquerque said he hopes to return to the VA by the end of the month to present the results of the latest trial. If VA officials approve, Next Step will finish the prosthesis and let Currier “make it a part of his daily life,” he added. The plan is eventually to fit Currier with two of the brain-controlled hands. Bringing the LUKE Arm to veterans resonates with Albuquerque, whose father served in the Navy for 20 years after losing both of his parents by the age of 15. Down the road, the hope is to secure federal funding to make these prosthetic hands available to more veterans, as well as to other amputees, Albuquerque said.